When I worked as a radio announcer, I would sometimes have what I call "radio moments." They were moments of coincidence. A big one for me was when I had Beethoven's String Quartet Opus 59 #3 in one CD player (let the video load to :52), and Jean-Féry Rebel's "Les Elements" queued up in another. If you put the above links in different tabs or windows and play the first two chords of each one after the other, you will notice a bit of cosmic nifty-ness. Another "radio moment" happened after teaching a class on Richard Strauss, who was not mentioned at all in the edition of our textbook that I was using (the textbook editor has since repaired the glaring omission). When I got in the car and turned on the radio, I heard an obscure neo-classical piece on the radio that turned out to be by Strauss. Anyway, my radio moment today was with Wagner. I turned on my car radio shortly after the beginning of a very engaging performance of the overture to Tannhäuser. I noticed dynamic contrasts and textures in this recording I had never noticed in other recordings, and I started thinking about Daniel Barenboim, and what he had to say about conducting Wagner in Music Quickens Time. It is essential to understand the difference between power and force, which is related to the distinction between volume and intensity in music: when a musician is told to play with greater intensity, his first reaction is to play louder. In fact, the opposite is required: the lower the volume, the greater the need for intensity; the greater the volume, the less the need for intensity. The effect produced by the huge outpouring of sound in Beethoven or Wagner is much greater when the sound is not forcefully controlled every step of the way, but rather allowed to grow organically, its natural, inherent power being the result of gradually accumulating strength. The build-up and release of tension are central to the expression of music. Thus even the most powerful chord should be played so that it allows the inner voices to be heard; otherwise it lacks tension and depends exclusively on brutal, aggressive force. One must be able to hear the opposition, the notes that oppose the main idea. After the piece was over, the announcer told me (and the rest of the listening audience) that the performance was by the Chicago Symphony Orchestra under the direction of Daniel Barenboim. I devoted a good ten years of my life to obeying the articulation indications of the Urtext. I was such a stickler that I often insisted on playing from manuscript facsimiles whenever possible. When it was not possible to play from an Urtext edition I would use white-out to remove "interpretive" articulations from my modern editions of baroque music. I truly believed that the key to great flute and recorder playing was to have as little distance between the "horse's mouth" and mine. And I stuck by that belief dogmatically until the time came for me to stop hitting my figurative head against the figurative wall. It took about two years for me to develop enough technique to muddle my way into a string quartet. I had three string player friends, a viola (purchased for $100 at a yard sale), a pulse, and I could read music. In my neck of the woods that, and the ability to make arrangements, was enough. I distinctly remember my first string quartet rehearsal. Everybody took out their pencils and, after careful discussion they changed the articulations in the music. Where a composer wrote a long slur, it was deemed more legato to divide up the notes into two bows rather than keep them on one. Once my jaw finished dropping, I kept my mouth shut and changed the articulations the way my far more experienced colleagues told me to change them. I pretended that I understood, but it took me a good ten years of violin and viola playing experience before I even got a clue. I knew that I would have to make a clean break with my baroque flute and recorder-minded idea of the Urtext if I wanted to continue as a string player. The idea of a passage being more legato when a slur is broken is tremendously liberating, especially now, since I understand the concept physically. A lot of 19th-century music written by pianists (Clara Schumann comes to mind) have phrase markings in their violin parts that look exactly like slurs, but they don't function like slurs. They function as pianistic phrase markings. I imagine that Clara Schumann, who knew very little about the physicality of playing the violin, trusted Joseph Joachim (the person she wrote her violin music for) to take care of the violinistic business of bowing. String players even need to change bowings in order to match the way that wind players make slurs. A stroke of the tongue on a wind instrument is a different animal (or a whole different zoo of animals) from the stroke of a bow on a string instrument, and these strokes only match successfully when the musicians are very sensitive to one another. Context usually comes into play. Thanks to becoming a string player I have a whole new perspective on the Urtext. The Urtext is not an authoritarian document. The Urtext (and I'm talking about 17th and 18th-century music now) usually has the intended notes, the intended rhythms, articulations, and the composer's phrase markings. The composer leaves the interpretation of said notes, rhythms, articulations, and phrase markings to the musicians who are playing. Just because a composer didn't write a crescendo mark between the "P" of piano and the "F" of forte doesn't mean that all the notes that lead up to the forte are supposed to be played piano. A dot or a dash or a wedge is a composer's suggestion, and the interpretation of an accent mark has everything to do with its context. It is up to us to create a context where the music can live. To be able to grasp the substance of the music itself is to be willing to begin a never-ending search. The task of the performing musician, then, is not to express or interpret the music as such, but to aim to become part of it. It is almost as if the interpretation of the musical text creates for itself a subtext that develops, substantiates, varies and contrasts the actual text. The subtext is inherent in the score and is itself boundless; it results from a dialogue between the performer and the score, and its richness is determined by the curiosity of the performer. Barenboim is, of course, writing from the standpoint of a solo musician (like a pianist, which he is) and a conductor (which he also is). There is another full set of elements that come into play when the members of a group of musicians add their own subjective and often un-uttered versions of a musical subtext. Musicians all have different reactions to form, dynamics, and harmonic changes, and they all have technical concerns. Everyone has to consider the difficulty of particular passages, and everyone has places in the music where they need to blend, and places when they need to come to the musical foreground. There are also concerns with intonation, counting accurately, and playing the desired articulations with the desired degree of comfort. Perhaps the only constant in any given performance or reading is the unchanging role of the (usually dead) composer. If the composer is alive s/he would probably prefer to play a constant and unchanging role in a performance too, and simply be a fly on the wall. At least I feel that way. I believe that a composer's responsibility for making choices, sub-textual and otherwise, ends when a piece of music is played "in the flesh." Put simply, Big Ideas are more often than not also Vague Ideas—their size does not necessarily denote great intricacy. While much mainstream arena-rock is certainly detailed, it's more the combined sense of "surface details" that colors the music with edge and oomph. In other words, most of the detail is effective as a wash. On the whole classical music seems to be much more concerned with its details and nuances interacting on the molecular level, saying something less monolithic but more specific. So perhaps it's natural that rock's more homogenous and non-rhetorical use of detail should be a good fit for the very different demands of the arena. Thanks to J for this link to the New York Public Library Digital Gallery where I found this and over 6000 other fantastic music images. I'm headed back there now! Did anyone else notice that the piece that John Williams wrote for Barack Obama's Inauguration has the same as the instrumentation as Olivier Messiaen's Quartet for the End of Time? I have been so excited all day today because of tomorrow, so I broke out in string-quartet song, and am having my own private (now semi-private, because I'm sharing it here, with you) musical celebration of Barack Obama's inauguration. This Song of Hope (here is the score and the parts) is my commemoration of the moment to come. Opus 118, Way to Go! I saw an all-too-brief segment on what I think was a CBS news show that featured a group of musicians from the Opus 118 Harlem School of Music this morning. This is the music school that grew out of the tireless work of violinist Roberta Guaspari nearly 25 years ago, and it seems to me that it represents everything that can be right about developing and maintaining a young and lively musical community within a larger community. The television station showed the group of about 28 kids playing a portion of a very short piece, and, in their "newsy" way, they switched to an outdoor reporter, who said he liked what he heard. A promise for a performance later in the program kept me tuned to the station. The big moment came. The anchor asked Guaspari how much they practiced for their upcoming performance at one of the Inaugural balls (way to go, I say), and the vast gulf between the musician and the non musician reared its open mouth. These kids have been practicing all of their musical lives. The quality of their collective playing made it very clear to me that these are kids who practice all the time, year in and year out, both individually and collectively. What was the anchor thinking? The group played a jazzy piece that I suppose they chose for TV audience appeal, and it was cut off before the end (or at least before the possibility of applause) with a quick cut to the guy out in the street who said something like, "Hey, isn't that the group that Meryl Streep made a movie about?" The anchor asked Guaspari, who answered in the affirmative, and they went to a commercial, and then onto other stuff. Here is a short film about the school and the people who support it. I remember making this collage. It was in 1992, and I had just started playing the violin. 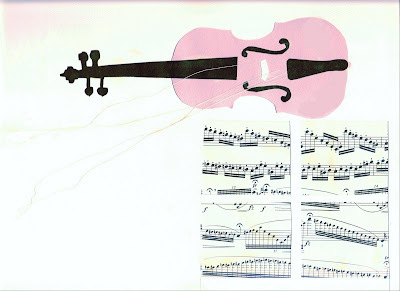 Making this collage was a way for me to tell myself that playing Paganini Caprices on the violin was something that I could comfortably admit I would never be able to do. I believe I even cut up a perfectly good piece of music to make the collage. I imagine that the collage "says" a lot more about my state at that time than I am willing to admit, but I will leave that kind of interpretation to people who are more subjective than I am. A few years ago, during a particularly strong technical surge and the deep desire to embrace the violinistic parts of my personality, I got myself a new copy of the Paganini Caprices. I would take it out from time to time, and then I would immediately put it away. Now the Paganini caprices are on my stand. I have been chipping away daily at #13, one of the more accessible of the Caprices. I don't know how many of the Caprices I will be able to learn, but I do know that I will be able to learn and to play some of them. Seeking distraction, I began my computer-assisted evening's entertainment with Google Earth, and somehow ended up at this treasure trove of arrangements for brass ensemble made by Jean-François Taillard that you can download (scores and parts) for for free. It is times like these that wish I played a brass instrument, but there is only so much you can do in a musical lifetime. I guess I'll go back to my fiddle now. You can lead a horticulture . . .
. . . but you can't make her think. It's an old joke that brings to mind the (horticulturally-inspired) saying that you should "bloom where you're planted." Some of us do not bloom where we are planted. We have to seek out places and cultural climates where we can thrive. In my case, I have had to create my own figurative soil in my own figurative hothouse. Our American melting pot gives us a continually growing and changing culture, which gives us a continually growing and changing set of musical cultures. How so many musical cultures can survive (and even thrive) at the same time has a lot to do with the fact that most music is no longer connected specifically with place. Music (of all kinds) can jump around from location to location so quickly by way of the internet that it is hard to imagine that there are still audiences in actual earth-based places that attach themselves to styles of music, but there are. We used to have places connected with styles of what was once popular music like Viennese Classical music (though none of its major composers actually came from the city), Neapolitan songs, New Orleans Jazz, Kansas City Jazz, and Motown music. It was music that came from a specific place, reflecting its cultural climate and its values. We have "Country Music," which takes its themes and values from rural neighborhoods like the ones around me (and similar neighborhoods and farming towns that exist all over the country), and transmits them all over the world. We also have a whole slew of styles that reflect urban life. These musical styles seem to be geared towards audiences that live in certain places (dare I say "markets?"). I can't imagine that there are that many successful country music stars who (still) live in small rural towns (Nashville itself seems to be a series of recording studios), but their songs certainly "speak" to people who do. I have been thinking about this because once again I will face a semester of community college students who have listened only to pop music and country music for their entire lives. I am going to ask them to observe the past (Europe from the 8th century through the 20th), and see if I can get them interested in a world of music that they would otherwise never even consider listening to. Every semester a handful of students drop the class because of a total lack of interest, and every semester a handful of students eventually find a way of connecting to what they hear. The big problem, I now realize, is that the music that we cover in our community college survey of "Western Classical Music" has very little to do with the culture that surrounds the community college students in our rural area. It is not that our area is devoid of culture, it is that our area has a built in set of cultural (and musical) values that have everything to do with the local way of life, and very little to do with the culture I grew up with in Boston or experienced in New York, Vienna, or Hong Kong. I was a stranger when I arrived here in East Central Illinois more than 20 years ago, and I remain a stranger today. I seek out other strangers. I have found some extremely interesting ones over the years--mostly transplants from other places who came here for the university, and many who have moved away or died. I cannot tell my community college students that what I have to teach them will be meaningful. Learning how to listen to classical music is not the magical answer to the struggles and pressures that rural young adults face. There are only a few community college students who take a music course because they are passionately interested in the subject. Most of them take the class to fulfill a requirement, and some are eager to get a good grade. If they get any more than that out of the class, I can consider myself successful. Here's to a new semester! Daniel Wolf has put together a nifty Winter Album of twelve (and maybe more) piano pieces that incorporate a great range of compositional techniques. Scott Spiegelberg found this wonderful clip that is sure to make you smile. My grandmother kept magazines like this April 30, 1945 Life magazine on her coffee table. Thanks to Anne for this! And music criticism of unusual quality. I made some arrangements of two chestnuts of secular Medieval Music for the Darkwood Consort a while ago, and thought I'd share them here. You'll see (and hear) why Colin Muset's When I See Winter Return and the Lamento di Tristano (by an unknown composer) have been around for centuries. There's a post over at Anesthesioboist that has a lively discussion about what people (mostly MDs, it seems) would like to do as alternative professions. Yup. I must have a great deal of resilience. I got the chance to blow the shofar this Rosh Hashana. Jennifer Paull appreciates the benefits of musical synaesthesia while having an MRI: You could knock me over with a feather right now. Serendipity in action: My grandmother (the one with the Life magazines on her coffee table) happened to be named Anne. "Thanks to Anne!" expressed thanks to another Anne who sent me the Erhu video. What a nifty way to wrap up the old blogging year and ring in the new one! Thanks for the fun Rob and Michael! Happy 2009! You can either download the whole piece from here, or you can figure out the pattern and finish it for yourself! Yesterday I was contacted by a very nice person who told me that I had been chosen, because of my accomplishments as a composer, to be in some kind of international directory of important people. She happened to call right after I missed a call from my daughter, and, expecting that the new caller was my daughter, I answered the phone with a (probably loud) "Hi Sweetie!" I just had to give the person calling a hearing. Sure enough, after a series of questions about my work that were engineered to make me feel good about myself and my accomplishments, the question of paying for membership came up. When I told the caller that I didn't have money for this kind of thing, she used the word "marketing" in her reply, saying something about the importance of marketing to get my work known to people of influence. The idea of "marketing" myself as a composer sort of turns my stomach. The days of non-commercial composers actually making money (like enough money to live on) from writing music were pretty much over when I started writing. It is even difficult to find people willing to make room on concert programs for living composers, unless they specifically tailor their programs to include new music, or they play with an ensemble with an unusual configuration of instruments. I hate the idea of telling someone that my "product" is something that they should "buy" because of who I know or who I am connected to. I hold the belief that if what I write has merit, musicians will want to play it, and if what I write does not, musicians will not be interested in playing it. The "real world" of commerce, marketing, and business has always been repelling to me, especially when it comes to music, which I still hold to be a sacred and personal vehicle for self expression and deep interpersonal communication. I do have respect for the people who can make a go of "selling" their "product," but you will probably never see me at the "market." I'll be at home, and if anyone is interested in what I am doing musically (or otherwise), they know where to reach me.